Did you know that even the wealthy should play by a set of money rules? 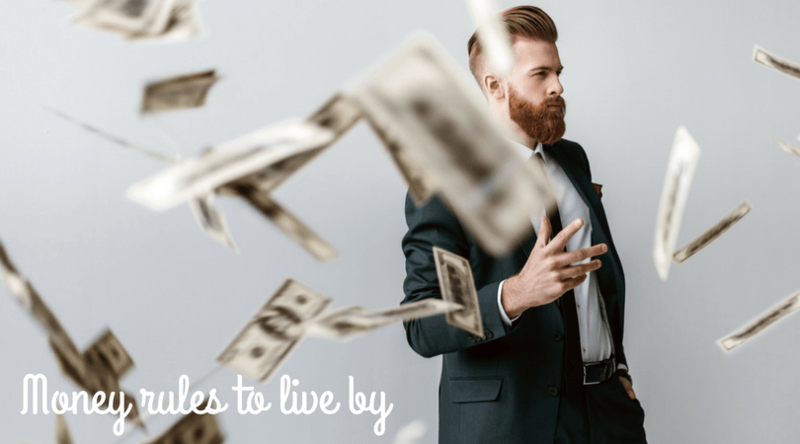 It’s true, it doesn’t matter if you have millions of dollars in the bank or if you only have enough to cover rent, these money rules to live by can help you manage your money better and make your money work for you. When you think of being rich, what kind of rich do you want to be? Do you want to make millions of dollars, or are you the type of person who just wants to pay off debt and make enough money to live comfortably? 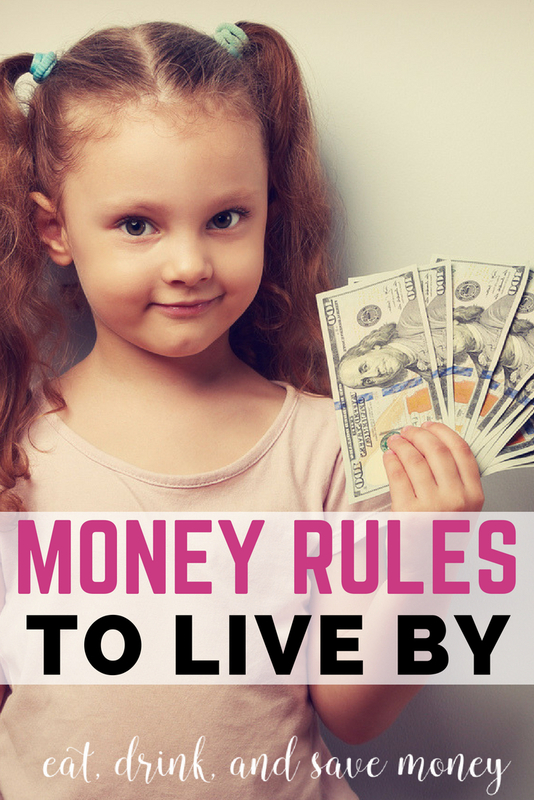 No matter where you fall in the spectrum, a set of money rules can help you live the life you want. When Tom and I were right out of grad school, all we wanted was to pay off his high interest law school debt. Sure, we wouldn’t have said no to becoming millionaires, but it wasn’t something that was on our minds. All we wanted was to be able to pay our bills and get on the right financial track. Now that we have our highest interest debts paid off we are still following these rules. You see, it doesn’t matter how much money you have, there are some rules that you need to follow no matter what. My brother in law is a financial planner and he says it’s surprising how many people look like they have money but actually don’t have any money in savings. Plenty of people live large just to keep up with the Joneses when in reality they should be saving for the future or a rainy day. Why should you follow these rules? Because if you aren’t careful with how you spend your money, you could end up feeling anxious and depressed about money. Financial anxiety can make you lose sleep, put a strain on your relationships, and lead to a loss of self worth. 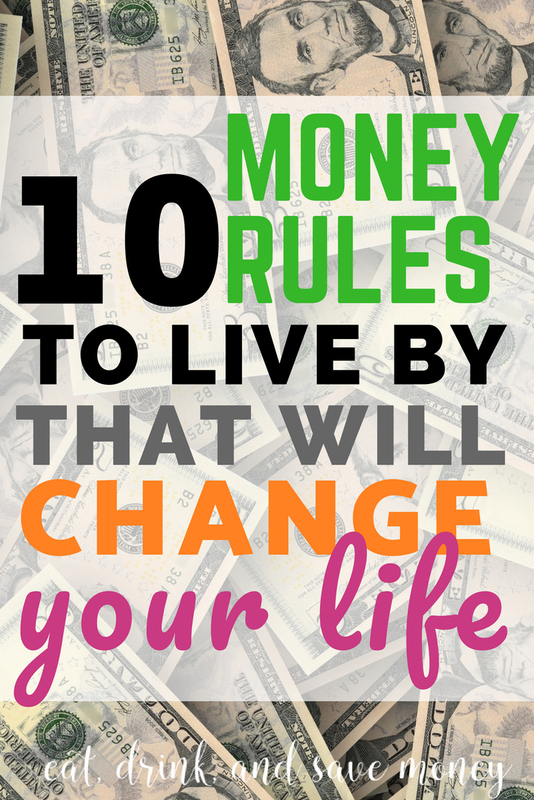 Don’t let money control you! 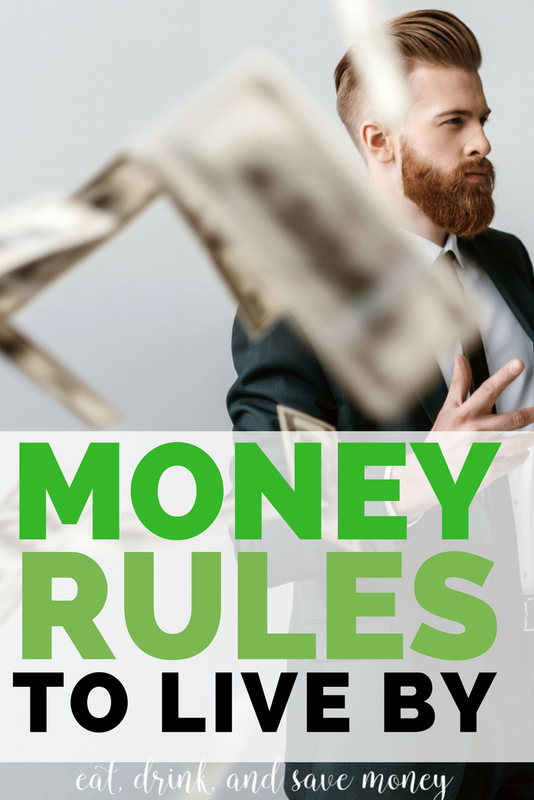 Follow these money rules instead. These rules define my life. In fact, they have changed my life. 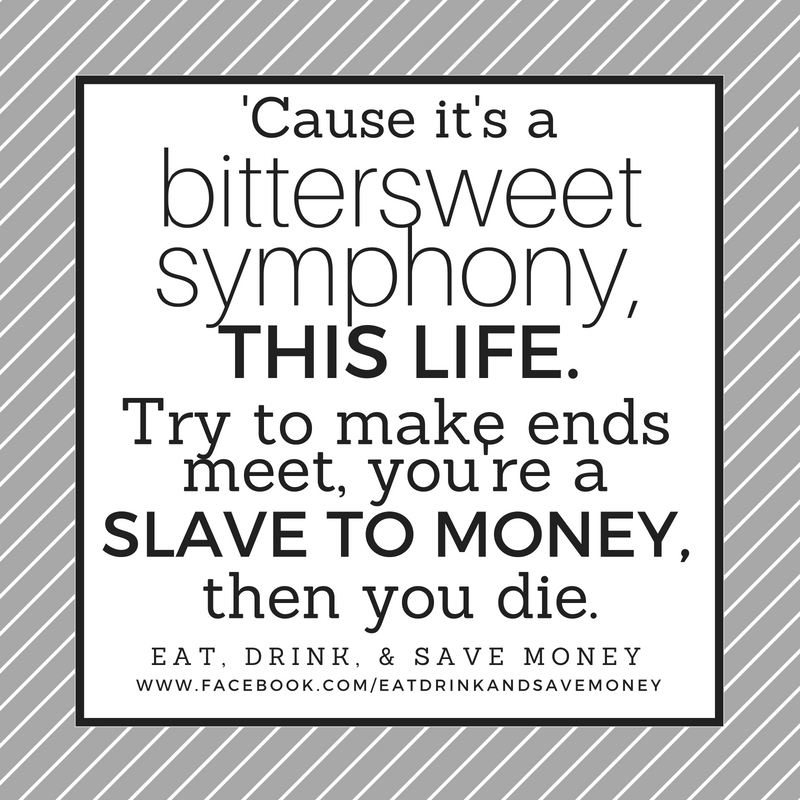 I even like to think of these rules as defining “The Eat, Drink, and Save Money Lifestyle“. Seriously, if you want to know how my family is able to save money while enjoying the things we love in life, this is how. These rules have set the precedent for how we make financial decisions. If you are interested in learning more about changing your lifestyle, read this post on 8 Steps to Think Like a Saver. Being a slave to money means that money controls you. You can overcome this by being in control of your money. If you’ve ever had to live paycheck to paycheck, or if you have ever lived in poverty, then you are probably rolling your eyes right about now. You probably think that only rich people are able to be in control of their money. Let me tell you right now that there are plenty of rich people who are not in control of their money. Lots of rich people lose money when they let it control them. So, how can you take control of your money? Make a budget, pay yourself first, and then save what is left for emergencies or large purchases. You may not have all the fancy things in life, but financial stability feels so much better than new shoes. I promise! A.K.A. Spend less than you make. This is the simplest way to save money and feel comfortable. You can go extreme by taking this one step further and live life way below your means. We bought our first house the same year that Tom started his first job out of law school. We were young and had dependable jobs so we were automatically pre-approved by the bank for a home that we couldn’t afford. Just because the bank tells you that you can afford x amount for a new house doesn’t mean you should spend that much. We knew that with our high interest educational debt that we couldn’t afford a home that was 2.5 times our annual salaries. Sure, the bank said we could, but at what cost? If we had bought a home that was 2.5 times our salaries we would have had no money for date nights, travel, and more importantly, saving for the future and paying off debt. Buying a home beneath our means was the best financial decision we ever made. You know how I feel about the Joneses? F*ck them. That’s how I feel. I don’t normally cuss on my blog because I think it is tacky and unnecessary, but in this case, it is warranted. Did you know that we tend to adapt to the culture where we live? It’s true. We have a habit of picking up habits from the people we spend the most time with. Think about your friends for a minute. Do you all wear similar clothes, buy similar food, and do similar things? What about your town? Do all the moms do the same things? You are probably nodding yes right now. Dare to be different. Make money decisions based on what you want and like instead of letting your surroundings dictate your decisions. You can’t stray from the pack unless you are confident in yourself. Know what purchases make you happy, figure out your personal style, and only spend money on experiences that bring you joy. It’s also important to be confident enough to talk about money with your friends and family. Yes, I understand that talking about personal finance has long been a faux pas, but these days it’s perfectly normal. You don’t have to give specific details, but it’s imperative that you feel confident enough to decline invitations if you don’t want to (or can’t) spend money on something. All you have to say it, “Sounds fun, but it’s not in the budget right now”. Easy peasy. Remember rule #1? Don’t be a slave to money. My action item for rule #1 is to set a budget, pay yourself first, and save for a rainy day. Saving for a rainy day is so important that I put it twice. Do it. Next time you want to buy something, ask yourself if you’d rather have that money in savings instead. Not sure what to save for? How about a big, fancy vacation that you don’t have to charge? Or pay off debt. Or save for your kids to go to college. Or put that money into a retirement account. The possibilities are endless. We recently had to spend over $1,000 on car maintenance. Do you know how good it felt to be able to afford that expense? It felt amazing. Way better than any impulse purchase from Target. We were able to pay for it because we had saved for it. We made the conscience decisions over and over again to not buy things we didn’t need so we could afford emergencies. It’s not always easy, but it’s worth it. Pro Tip: Target your savings. Who says you can’t have 10 savings accounts? You know what? You can! Start as many as you want for different reasons. Have one for travel. Have one for a rainy day. Speak to a financial planner about investments too! It’s impossible to enjoy your life if all you do is save money. Pick a savings goal and when you meet it, reward yourself. After we paid off Tom’s loans we went on a vacation. It was fun to have something to look forward to. You can do this with regular savings too. Just pick an amount you hope to save and when you meet it do something big to celebrate. I want to shout this from the rooftops: you get what you pay for. Take my vacuum for example. I must have bought 3 cheap vacuums at $75 each before my husband splurged and bought me a Dyson. Seven years later and it still runs well. If you use an item often, consider buying a high quality one. Bonus points if you can find a high quality item used! I spend a little more money on my clothes than I’d like because I buy high quality used clothes from high end consignment stores (and Goodwill). I could save money by buying them at Old Navy or Target, but I prefer to buy high quality clothes over fast fashion items that will barely survive 7 washes. We’ve all heard it before, time is money. This is true, but there is so much more to this story. You don’t just need to know the monetary value of your time, but also how time can strengthen your relationships. For example, is time spent working on your side hustle worth sacrificing time with your family? Honestly this is a question I ask myself often. It’s also the reason that I would rather make less money if it means I can spend more time with my family. You should also know the value of your time when it comes to hiring help. Is it worth it to spend 4 hours a weekend cleaning your house if you make 6 figures? Probably not. Head here to figure out the value of your time. From someone who calls herself a digital influencer, this is a hard one to write, but it’s something that needs to be said. Let me explain to you how influencer marketing works. When a brand, let’s use Neutrogena for example, comes out with a new product, they have a big budget to use for marketing. They use that marketing budget towards commercials, print advertising, digital advertising, and influencer marketing. That means that when you see your favorite bloggers and Instagrammers sharing information about products, they are most likely getting paid for it by the brand. For example, I’ve worked with Neutrogena on a launch before. That post is actually one of my most popular posts, which means that Neutrogena did well working with me as a brand. I don’t care how much you love the media that you follow, that doesn’t mean you have to be influenced by them! I’m including myself here! Just because I love something doesn’t mean you should buy it. Do not, I repeat, DO NOT LET THE MEDIA INFLUENCE YOU. Buy what you want to buy because you want to buy it. Period. Remember, influencers and bloggers get PAID to influence you. Be smarter than that! Everything in life is negotiable. Even hotel rooms and cars. Seriously, it’s all negotiable. I negotiate for free hotel rooms on a monthly basis. If you think something is overpriced, ask for a lower price. I’ve helped negotiate the price of a car before and it’s actually a lot of fun. What’s the worst that can happen? They say no? If so, you can go somewhere else! Read this post to learn how to negotiate the price of a car. Stop letting your money control you. Once you take control you will feel happier and more relaxed. Once you stop buying things you don’t need you end up with a calmness that allows you to appreciate pure happiness. Money can’t buy happiness. Why not enjoy the things that can bring you happiness without fretting about money? For more exciting tips about saving money, follow my Facebook page. I share personal tidbits of my life on Instagram, and I occasionally share things on Twitter.